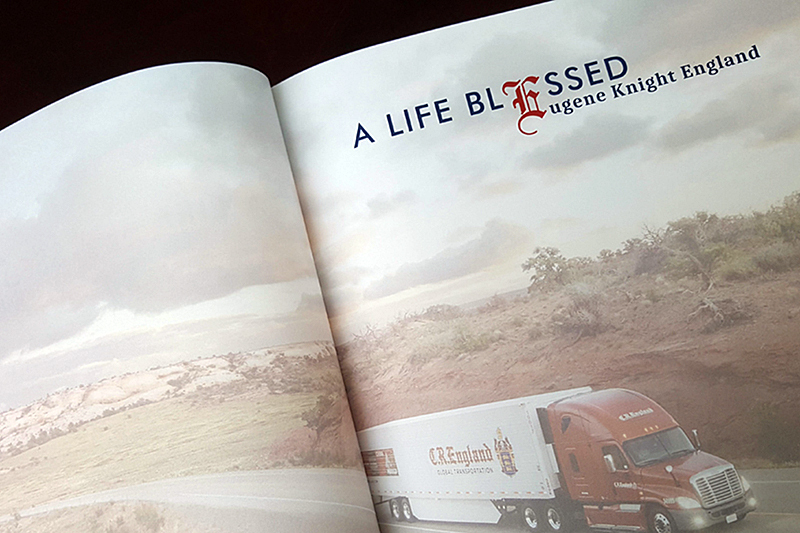 Working with Gene to bring this oversized coffee-table book, "A Life Blessed," to fruition was a joyful experience. When we first met Gene, still working at age 92, he was more energetic and busier than most 50-year-olds we know. "I don't have time to write a book!" he insisted. His wife, Dorothy (with whom we had worked on her own history a few years prior), and his sons (who now run C.R. England), eventually talked him into it. Now, at 99, he is still going strong. 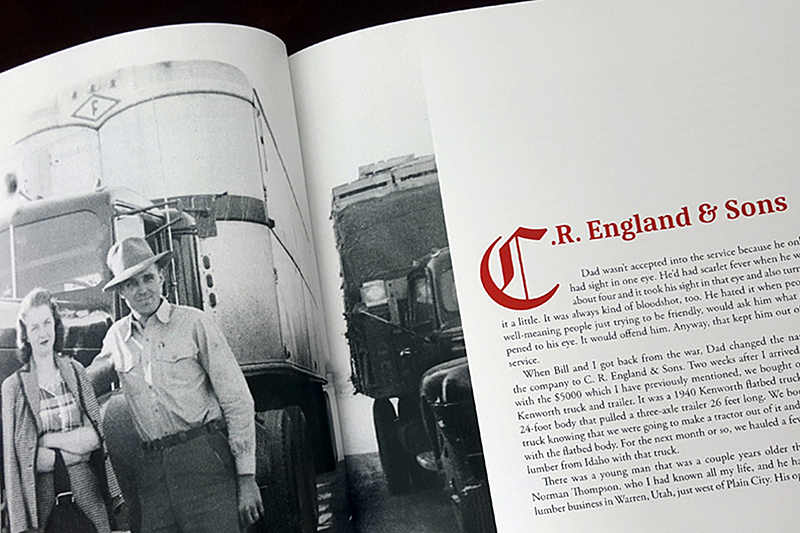 The book is filled with great stories about his father Chester Rodney England, who founded the trucking company; building the business with his brother Bill; and the pride and joy he finds in his close-knit family. One of Gene's guiding principles: always surround yourself with good people and then let them get on with it. "It's about working together to resolve problems for the greater good." 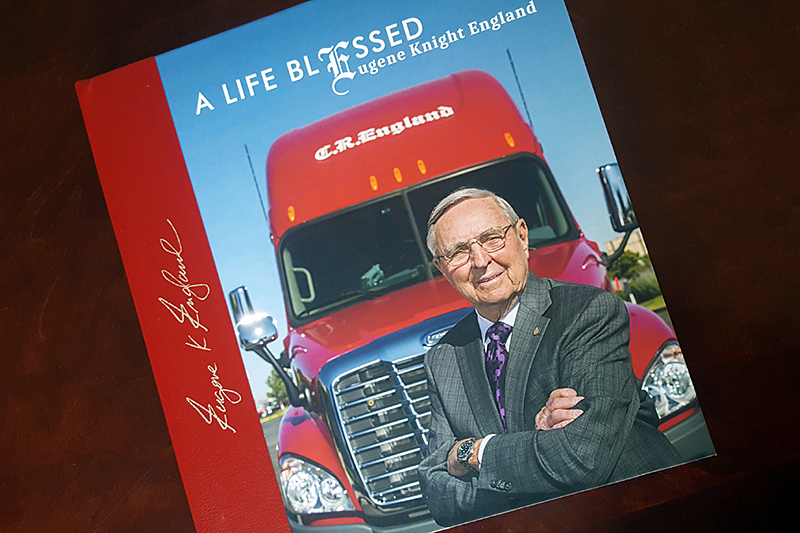 We were thrilled to be a part of documenting the extraordinary life of Eugene Knight England. Title page for "A Life Blessed." Gene was born in 1919 in Plain City, Utah, population 600. Three other major trucking companies also got their start in Plain City: Swift Transportation, Pride Transport, and Knight Transportation. For his service in the Battle of Okinawa, Gene was awarded a Bronze Star. Gene and his first wife, June, with a 1940 Kentworth truck. June passed away in 2009. Gene's son Jeff England with his first truck. Jeff went on to found mega-trucking company Pride Transport. Gene with four of his sons, who now run C.R. England Trucking.